You are here: Home / DIY / 12 Everyday Uses For Dawn Dishwashing Liquid! 12 Everyday Uses For Dawn Dishwashing Liquid! Dawn is something I have on hand all of the time and I LOVE to find other uses for things that I already have or that I already use often. I love finding ways to reuse something, too! From ant repellent to removing the skunk smell from an over curious dog, There are so many things Dawn can do besides just washing your dishes! Dawn Dishwashing Liquid has so many uses that I couldn’t begin to list them all! I LOVE that they even found out they can use it to save wildlife when there is an oil spill, too! If you have any tips to share about other uses for every day items or things most of us have on hand right now, please leave those in the comments! Everyone loves a new tip so don’t keep it to yourself! Share them with all of us! Here are just 12 of the uses I know of for Dawn. Do you know others? If so, please share them in the comments! Mix 1 bottle Dawn, 2 boxes Baking Soda, and 5 gallons water. Makes your own homemade laundry detergent. Mix 1 cup of corn syrup into 6 cups of water, add 2 2/3 cups Dawn, mix well without creating bubbles while mixing. To make glow in the dark bubbles add 6 glow sticks. Mix 1 teaspoon Dawn, 1 tablespoon vinegar, 1 gallon water. Makes a great carpet cleaner. Soap them up and rinse 2-3 times to get rid of the smell. For this one you might want to use a scented Dawn to help. Mix Dawn in warm water and soak your fingertips in mixture. This will soften cuticles so you push them back and/or nip them. Fill a plastic freezer bag (not all the way leave room for mixture to freeze) with Dawn and water and freeze, making a great ice pack that can be refrozen over and over. Mix Dawn with warm water in a spray bottle. Spray mixture on counter tops and clean counters. The thin residue left on the counters repels ants. Scrub down the sides and bottom of a plastic wading pool with Dawn to keep it clen and fresh. Any bubbles left when you fill the pool are a bonus! Other harsh chemicals left on as a residue can be harmful to the pool as well as the children. Dawn was made to remove grease from your dishes, it does the same to oil based stains on your clothes, so that makes it a great pre-treater. Apply Dawn directly to stains, scrub the stain with a toothbrush, add to your laundry and wash as you normally would. Place 1 drop of Dawn on your lenses and rub in and then clean off – there will be a fine coating left on your lenses that will keep them from fogging up. Soak your grill racks overnight in Dawn mixed with water, then finish the job with a wire brush. Bathe your pets in Dawn to kill fleas, it’s much gentler than flea shampoo and works great! Do you know of other uses for Dawn Dishwashing Liquid? If so, please share in the comments below! Excellent of heavily soiled jeans. My husband is a cattle archer/ farmer. And Dawn helps remove cow poop,blood grass sains and oil from his jeans. Yes! It’s great for stains! I saw a hint on a website/blog last year that Dawn could be used as laundry detergent straight out of the bottle. The recommended amount was 1tsp. It sounds crazy but I have been using it for over 6 months and am amazed at how great my laundry comes out, particularly the towels. Very soft, and fluffy, much more absorbent. Great tip!! Thanks for sharing! Dawn also works great for coating your plumbing pipes when used…. For the laundry deterg can you use in HE machines, and should I assume that for the laundry that it is the 9 oz bottle shown for the 5 gallon soap? also do you have a recipe for bug spray on garden veggie plants? and for weed control? I don’t have an HE so, I am not sure. I read that some people are using it in HE, but very little as it suds too much if you use more than like 1/2 tsp. The 9 oz is what you need for the 5 gallon soap. I don’t have a recipe for garden pest or weed control.. yet… my daughter and I are working on hers and looking for something so, I will keep everyone posted here! 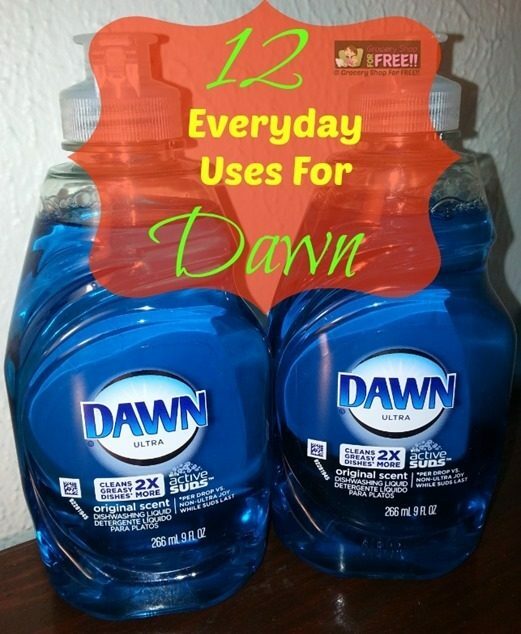 i use dawn as following to remove just about any type of stain there is; place stain in shallow container-wet with water and cover stain with blue dawn. use clean toothbrush and scrub stain to get dawn into fabric. next cover stain with baking soda and scrub again(use plenty). pour peroxide onto the baking soda. it will foam and you want to get the stain wet. keep water in the base of the dish(just enough to keep fabric damp) do not let it dry!! repeat process until stain is removed. it mayy take several hours but it works! I would be careful putting this on a color garment. As peroxide and baking soda both will work like bleach. They will fade your garment. You shouldn’t use it as laundry soap. It will eventually built up. Soap is not made for laundry you need detergent. It will also mess up the sensors on your washer. Any type of homemade laundry soap is not good. You can’t buy ingredients that will properly clean your clothes. My husband works in a factory swears by Dawn dish washing soap to remove grease and grime from his hands. Love multiple use items. Anything to save money. With a family of 10 it’s hard. 1 gallon of white vinegar, 1 cup of table salt & 1 teaspoon of Dawn is a great vegetation killer. Thanks for sharing – that’s a great one! As a fly killer for animals: dawn, Apple cider vinegar and rubbing alcohol or vodka (if you are afraid they will lick it). Works great!!!! I use it to clean my son’s baseball pants after those especially nasty games! His white pants are white again. I take Dawn and squirt a small amount on the red dirt stains. Then I wet a toothbrush in water and scrub in circles. Stains come out. I don’t have to worry about the blue piping on them getting bleached or having to scrub forever with other cleaners. Great tip! Thanks for sharing – I hadn’t thought of using it that way before! My sister keeps a bottle of Dawn in every shower. It helps wash off any of the poison ivy oils her family may have encountered. Every few weeks my daughter washes her hair with Dawn. It helps with the build up on her scalp from not washing her hair thoroughly with her regular shampooing. My sister is a hair dresser and suggested it! Also, for kids with blonde hair that turns green in the pool mix a small amount of Dawn and baking soda and make a paste to cover their hair. Let sit for 10 mins and rinse. The green washes out of their hair! Fyi, 3:1 solution of dawn and water is a great degreaser under your cars hood! Spray on all greasy parts of your COOL engine, and rinse with ample water pressure! Dealerships do the same with trade-ins. That’s how they do it! I use Dawn as shampoo and my hair is softer than regular shampoo. I even notice I have a little over half less gray hair. About a year ago my then 5year old got lice from someone in her kindergarden class. One day we were bathing the dog with dawn and my husband tells me to try the dawn on Valerie’s hair, he said if it works on fleas its gotta kill lice. I had already used that RID shampoo but she still had them so I was actually Picking them out by hand everyday after school, it was a nightmare. Anyway long story short I washed her hair with dawn and it worked beautifully. It killed all of them so I made everyone in the house wash their hair with it. We all had lice,omg!!! We still use it at least once a month just in case. 1. It works great for fleas on pets. One note… Suds a ring around the pets neck first. When you start washing their body, the fleas automatically race for the animals head. I don’t know why, but my groomer told me that. They use it for fleas at their store. 2. Add one tablespoon of dawn and one tablespoon of rubbing alcohol to a gallon of warm water to prevent snow/ice on sidewalk/drive. It will also melt snow/already accumulated. It worked great for me last week. So much better than everyone tracking in salt. Original Dawn is the preferred choice of spinners to get the grease out of freshly shorn sheeps’ wool– work’s wonderfully!! Wow! That’s a fun fact! Thanks! I use for hair to remove build up once a week. 3 tablespoons dawn, 1 cup vinegar, fill,with water in 32 oz spray bottle. Leaves hair soft. I do this approx. 2 days prior to getting hair colored. Color works better with lack of build up from styling products. Great soap scum remover in showers and tubs. Wet area, wipe on pure dawn with sponge. Let set for 30-60 min., wet again, wipe down and rinse. I have some questions about DAWN and is embarrassed to post it here. I have kitchen cabinets that don’t go to the ceiling, so grease and stickiness accumulate on the top. After scrubbing three times in a row and still feeling that stickiness, I tried Dawn on a wet sponge. The Dawn, literally, took the grime completely off. It’s the best for removing grease without harming your cabinets. I love all these other uses! Oh that’s a good one! Thanks for sharing! Thanks for sharing! That’s a great one!